South Korean actress and singer, Im Yoona (임윤아) attended the photocall of drama, 'Prime Minister and I (총리와 나)' held in Goyang, South Korea on December 23, 2013. 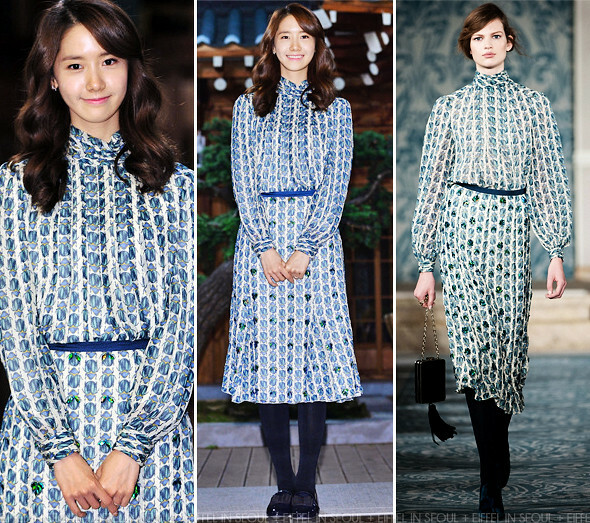 She was seen wearing bug-printed ensemble from Tory Burch Fall/Winter 2013 collection. Her look was completed with a pair of black tights and Suecomma Bonnie 'Alice' flats. This dress on her is horribly gaudy. The black tights and flats made it worse.